Free knitting eBooks are the ultimate resource for knitters. Each eBook includes a collection of free knitting pattern organized around a theme, such as holidays, winter wearables, comfy afghans and plenty more. You can easily download and print out each book for on-hand reference while knitting. On this page, find our most recently published eBooks. Find a complete list of our published eBooks here! 1. 9 Men's Knitting Patterns: Men's Knitted Hat Patterns, Knit Scarves, & More eBook - Men's knitting patterns are a great opportunity to simultaneously showcase your skills as a knitter and create a wonderful handcrafted gift for a special someone. The hardest part will be deciding which of these free knitting patterns to start with first. 2. How to Knit for Beginners: 9 Free Tutorials eBook - Inside you’ll find clear instructions explaining different needle types, how to cast on, how to decrease, and once you’re ready, how to start reading knitting patterns. Each tutorial is accompanied by clear photos and step-by-step written instructions. 3. 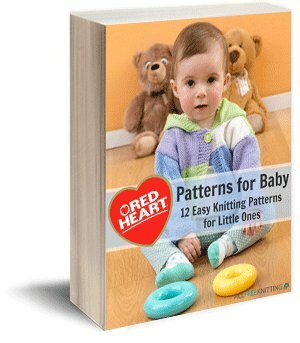 Red Heart Patterns for Baby: 12 Easy Knitting Patterns for Little Ones eBook - Whether you want to learn how to knit a baby blanket or you're searching for the perfect gift for a special niece or nephew, there's a pattern in this collection that's sure to catch your eye. 4. How to Knit an Infinity Scarf + 9 Fashionable Cowl Knitting Patterns eBook - No matter what time of year it is, it's the perfect time to start a new project - especially when you have a collection of fashionable infinity scarves and knit cowls such as these! 5. 15 Free Cute Knitting Patterns for Every Season eBook - This eBook features patterns for all the seasons. You'll find a large variety of projects that will keep you warm when it's chilly, and keep you looking and feeling good when it's hot. 6. How to Knit a Hat Volume 2: Free Knit Hat Patterns for the Whole Family eBook - Keep your family cozy with this collection of free knit hat patterns for adults, teens, preschoolers, and infants. This eBook has your loved ones covered. Find all of our published eBooks here!